OUR FRENCH EASEL IS HARDWOOD, ARTIST QUALITY, AND FULLY ASSEMBLED. 18 COLORS OF OIL, ACRYLIC & WATERCOLOR IN PAINT TUBES BY ART ADVANTAGE 54 TUBES! 24 LOUVRE OIL PASTELS in Retail Set by Lefranc & Bourgeois 2 CANVAS PANELS included (for Pastels). 3 REAL PRE-STRETCHED BLANK (PRIMED) ARTIST CANVASES (Shrink-Wrapped). ARTISTS BRUSH SETS; (1) Long Handled 6 PC Set, (1) Short Handled 7 PC Set, in retail packaging Brushes feature real wood handles 6 PC Set are long handled, mix of natural bristle, white synthetic, and pony, in rounds, flat, and filberts. Best for Oils and Acrylics 7 PC Set are short handled gold taklon, in rounds shaders and wash. Best for Acrylic and Watercolor WALTER FOSTER'OIL PAINTING' 144 Pages - Provides inspiration and instruction on every aspect of oil painting. OUR FRENCH EASEL IS HARDWOOD, ARTIST QUALITY, ASSEMBLED. This is a fully adjustable field, table, and studio easel with storage unit all in one! Constructed of hand-sanded european beechwood and brass hardware, it features a sliding drawer with divided compartments, a removable wooden palette, adjustable shoulder strap and a durable leather handle. Extends to a full height of 71 and accommodates canvases up to 34 inches in height. IN RETAIL SETS Art Advantage paint sets offer good lightfastness and covering power. Paints are manufactured using only quality pigments. Feature: High level of pigmentation. 24 LOUVRE OIL PASTELS in Retail Set by Lefranc & Bourgeois 2 CANVAS PANELS (for Pastels). 3 REAL PRE-STRETCHED BLANK (PRIMED) ARTIST CANVASES. Shrink-Wrapped Uniformed Medium Texture 11oz (Primed) Pure Cotton Duct Canvas 5/8 Profile Depth, Gallery Wrap (Staples on Back) Ready to Hang. ARTISTS BRUSH SETS; (1) Long Handled 6 PC Set, (1) Short Handled 7 PC Set, in retail packaging. Real wood handles 6 PC Set are long handled, mix of natural bristle, white synthetic, and pony, in rounds, flat, and filberts. Best for Acrylic and Watercolor. STRATHMORE 300 SERIES WATERCOLOR PAINTING PAD. NOW WITH: TWO 2 NEW COMPREHENSIVE PAINTING BOOKS (A 40.00 VALUE). WALTER FOSTER'OIL PAINTING' 144 Pages. 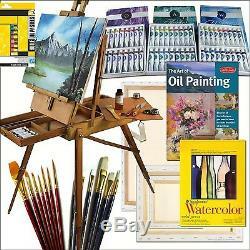 Provides inspiration and instruction on every aspect of oil painting. PAINTING WITH BRENDA HARRIS (Acrylic). 13 Step-by-Step Projects Volume 1 112 Pages. We hope you will see that we offer 5 star service. We may have more in stock than what's shown so please dont hesitate to ask. Please make sure you want the item before purchasing. We use a variety of suppliers across the US to ensure your item is delivered as fast as possible. Be done before placing your order. Our inventory changes constantly and we try to stay updated as best as we can. The item "100 Piece Artist Paint Set French Inspired Hardwood Easel Online Art Supplies" is in sale since Sunday, May 01, 2016. This item is in the category "Crafts\Art Supplies\Easels". The seller is "nataliurang0" and is located in Baytown, Texas.